This month visual novel Chaos;Head is getting an Xbox 360 port caled Chaos;Head Noah. Slated for a February 26 release, the sci-fi thriller is getting a special Akibahara promotion, complete with soda pop. Maid cafe Curemaid Cafe is offering Chaos;Head themed drinks and food. Above are two drinks named after the game's characters. Left is "Sena Aoi," which is made of blue hawaii and berry soda. 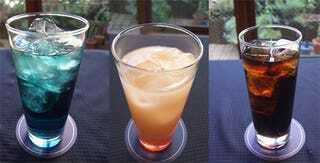 In the center is "Rimi Sakihata," which is made of pomegranate syrup and Calpis soda. The drink on the right? Cola. It's not named after any Chaos;Head character, but will be free of charge to those who bring a copy of the game to Curemaid Cafe. The story follows a high schooler who discovers a brutal murder while heading home. The murders continue and the student tries to contend with the reality that unravels around him. The Choas;Head promotion at Curemaid Cafe in Akihabara ends on March 8. The memories live on forever.